These are some of the marble magnets I made recently. (click picture to make it larger) I used directions from paper candy to help me figure it out. To make these, first I bought magnets, marbles, and silicon glue. (warning: at Michael's there were two types of marbles: lustre and non-lustre. The lustre are really shiny and reflective and not good for this at all.) First step, I cut out a bunch of small pics from magazines. Then, using a toothpick, I spread out the glue on the magnet, then glued the pic onto it. (any overhanging parts I just cut off) After that was securely glued on, I put a thin layer of glue onto the marble, which I then held tightly on the magnet. The silicon glue dries clear, so all is well. (warning: apparently silicon glue is bad for your eyes, so if you wear contacts or anything, you might want to wear gloves) Anyway, these are a few of the magnets I made. 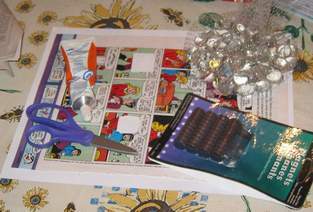 These are the supplies I used to make my second batch of magnets. I just made these magnets. The glue I used on these was different from the stuff I used before, and I think it didn't work out as well. Also, I used smaller magnets so you can't see the magnet behind the marble.